This article is about the spin-off anime series. For other uses, see Capsule Monsters (disambiguation). Yu-Gi-Oh! Capsule Monsters is a twelve-episode mini-series commissioned, produced, and edited by 4Kids Entertainment (much like Yu-Gi-Oh! The Movie: Pyramid of Light) that is a part of the Yu-Gi-Oh! franchise. Unlike the movie, this mini-series is actually set before Dawn of the Duel. Set before the end of the second Yu-Gi-Oh! anime series (Yu-Gi-Oh: Duel Monsters)—between the Grand Championship and Dawn of the Duel—Capsule Monsters involves Yugi, Joey (Jonouchi), Téa (Anzu), Tristan (Honda), and Yugi's grandfather Solomon (Sugoroku) being pulled into a world where Duel Monsters are real. They find monster capsules that they can use to summon monsters. It is similar to the Virtual World arc in many respects. It is unrelated to the Capsule Monster Chess game featured in early volumes of the original manga. 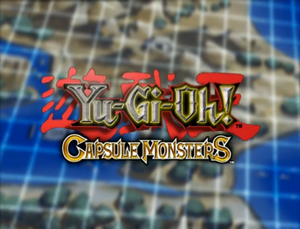 The first mention of Capsule Monsters came on the retailer website Talkin' Sports in December 2005, but this information was not widespread, and the existence of the project remained unknown to almost the entire fanbase until 30 January to 2 February 2006, when the Irish children's television strand The Den aired the first four episodes on RTÉ Two. Historically, it was not unusual for RTÉ Two to premiere episodes of Yu-Gi-Oh! some time before other markets; for example, the concluding episodes of seasons 3, 4 and 5 all premiered on it. Like all the series' spin-offs, it was simply referred to as Yu-Gi-Oh!, lacking its subtitle, on the television programme listings of the 28 January - 3 February 2006 edition of the RTÉ Guide, meaning that it was unknown to viewers that it was airing. However, the Den never actually promoted new episodes when they aired, and this held true for Capsule Monsters when it debuted after a re-run of the Grand Championship arc. The third episode was accidentally stumbled across by a LiveJournal user who posted the news and screencaps to a LiveJournal community, Play the Damn Card. There was initial confusion amongst fans - particularly over the discovery of the series in such an unlikely place. 4Kids eventually clarified the nature of the show. After the first four episodes of Capsule Monsters were aired, RTÉ Two went back to broadcasting Season 1 of Yu-Gi-Oh! GX. When the channel finished doing this on 20 July 2006, it aired Millennium World and The Ceremonial Battle. When that was done, the complete series of Capsule Monsters was aired in Ireland between 25 August - 19 September 2006. Capsule Monsters aired on the British digital television channel, Sky One. 4KidsTV acquired the license to the Yu-Gi-Oh! Capsule Monsters Series for the 2006 US Fall Saturday morning lineup. The first episode aired Saturday, September 9. Capsule Monsters also aired in Germany on the channel RTL II. Yugi Muto (romanized as Yugi Mutou in the English-language manga) wakes up after having a strange recurring nightmares about the Pharaoh being captured by an evil monster with glowing red eyes and telling him that why he is having these dreams will become clear when he "plays the game". This time, the Millennium Puzzle starts glowing in response to the dream, bewildering Yugi even further. Before leaving for school that day, Yugi noticed that his grandfather, Solomon Muto (Sugoroku Mutou in the Japanese versions and English-language manga), had not returned from his "secret expedition" (Yugi was told at the last minute) as his flight was due last night. Yugi is worried about the fact that Solomon is missing. Meanwhile, there is a new game on the block; the Capsule Monsters board game is the new fad in the Duel Monsters craze, and Yugi has already taken the opportunity to learn the rules of the game. When Joey Wheeler (Jonouchi Katsuya) breaks the news about the trip, Yugi and his friends could not contain their excitement. Yugi, Tristan Taylor (Hiroto Honda), and Téa Gardner (Anzu Mazaki) agree to take Joey's other three tickets. Just when the private plane for the trip approached its final destination, the engines cut out and the aircraft crash lands in a mysterious forest. After Yugi and his friends evacuate the aircraft, they find a man who says his name is Dr. Alex Brisbane. When Yugi lets slip to Brisbane that he is Solomon Muto's (Sugoroku Mutou) grandson, Brisbane tells him that he's a colleague of Grandpa, and on their latest expedition together he disappeared. Now Yugi knows just where Grandpa had gone, but the Pharaoh still suspects something. They just happen to win a trip; their plane just happens to crash; and they just happen to meet the man who was the last person to see Grandpa. It all seems a little bit coincidental. Brisbane shows Yugi and the gang where he last saw Solomon. Yugi and his friends are surprised when they discover that Brisbane last saw Solomon in a pyramid. Brisbane explains that he believes it to be the legendary pyramid of Alexander the Great, and that it's supposed to contain some sort of ancient game. They check it out, narrowly avoiding a number of dangerous traps, and come across a room that, as Tristan put it, is the size of Cleveland. The floor looks like a giant map of different land types, which looks incredibly familiar to Yugi. Joey decides to check it out but, to everyone's surprise, disappears into thin air the second he steps on the map. Coming to the conclusion that Solomon must have gone to the same place as Joey, the rest of the gang decide to follow, leaving a bewildered Brisbane behind. They find themselves in a forest, with Joey nowhere to be seen. Yugi notices a lot of egg-shaped rocks around, but before they can investigate, some giant cockroaches (Gokibore, a monster from the Volume 6 expansion set) and a giant praying mantis (Kamakiriman, from Volume 3) ambush them. The escapes of Yugi, Tristan, and Téa causes them to have to split up. Yugi is cornered by the mantis, so the Pharaoh takes over to protect him. He accidentally touches one of the strange egg-shaped rocks whilst jumping, which somehow causes Celtic Guardian to appear. Celtic Guardian attacks the mantis, destroying it. Meanwhile, Tristan and Téa escape the cockroaches by ducking into a cave. They find themselves on a beach, accompanied by two monsters: Thunder Kid and Happy Lover. At the same time, Joey is up high on a mountain, looking over onto the forest that the gang are in, hearing Yugi's shouting. Suddenly, Kurama comes up behind him and grabs him by the shoulders, flying away with Joey in his claws. Back in the forest, Celtic Guardian disappears in a beam of light, transforming into a small capsule. Now, Yugi knows where he'd seen this before. Somehow they have entered a real life version of Capsule Monsters. However, he is soon again attacked by a monster, this time it's a Trent. Pharaoh realizes the strange device on their wrists are for launching the capsules that house their monsters in order to summon them. Calling upon Celtic Guardian, the Pharaoh attacks the tree, but it gets the upper hand and injures Celtic Guardian. The Pharaoh feels Celtic Guardian's pain and realizes that the Capsule Monster world is a deadly Shadow Game. To make matters worse, the Trent turns surrounding trees into copies of it to assist its attack. However, the Pharaoh releases a new capsule monster to assist them, the fire-attribute Hinotama Soul. It easily burns the Trents to ash. The Pharaoh switches with Yugi, and Yugi runs off to find his friends. Elsewhere, Joey has been dropped by the Kurama into a nest of its young. Joey repeatedly jumps off cliffs housing Kurama nests to escape until he lands on a branch and accidentally releases Baby Dragon from another rock. Joey boards Baby Dragon and flees the mountains. However, a flock of Kurama chase after them. Realizing there are too many to take on head first, Joey decides to trick them into getting stuck in a small opening in a canyon. On the beach, Tristan figures out that Happy Lover and Thunder Kid are monsters they accidentally released from the egg-shaped rocks back in the forest when they ran from the giant roaches. Suddenly a giant sea monster called Root Water emerges from the ocean. Happy Lover and Thunder Kid stand before it to keep Tristan and Téa safe. Elsewhere, Joey has taken refuge behind a waterfall and checks his guide book, still believing himself to be in India. Joey then notices a treasure chest behind him and Baby Dragon and opens it. However, instead of treasure a scroll wraps around him, and Baby Dragon burns it off him (with Joey having to put out the fire on him in the waterfall). The ashes of the scroll turn into a map, and Joey wonders if it's a treasure map. Back on the beach, Tristan is having Thunder Kid attack Root Water with limited success as Thunder Kid is taking a pounding from the giant monster. (They too realize they feel the pain inflicted on their monsters.) Téa remembers Yugi's advice on how to play the board game version of Capsule Monsters and has Happy Lover heal Thunder Kid with its Heart Beam. Tristan then decides to blind-side Root Water with a sneak attack and Thunder Kid is successful in frying the fish. However, instead of vanishing, Root Water's charred body shatters and the beast evolves into High Tide Gyojin. It then creates a typhoon, sucking up Téa and Tristan along with their monsters. However, Solomon arrives and uses his Summoned Skull to blast High Tide Gyojin apart, saving Téa and Tristan. Having seen Summoned Skull's "Lightning Strike" attack, Yugi heads to the beach to find Téa and Tristan unconscious with their monsters. However, his mind is put to ease when Solomon walks up to him and tells him that they're resting after the ordeal they went through. Yugi happily clings onto his grandpa and cries in joy of seeing him again. Later, Yugi and the others make camp and begin to wonder where Joey is in the Capsule Monsters world. At the same time, Joey has gotten hungry and follows the smell of the campfire to his friends (after nearly fallen to his death before Baby Dragon managed to catch him). The Pharaoh switches with Yugi and explains that their dilemma of being in this world won't be an easy problem to solve. However, Téa points out that the flowers around them have gotten closer since they set up camp. Solomon tosses a stick from the fire into the flowers to reveal that they are actually a pack of Flower Wolf. Everyone but Solomon (whose Summoned Skull is too high level to be used frequently) releases their Capsule Monsters to fend off the pack. However, the Pharaoh knows they don't stand a chance and has Thunder Kid blind the wolves temporarily by reflecting its lightning off Celtic Guardian's sword. The next day, Tristan and Joey do a victory dance while the pharaoh and Yugi wonder about the safety of their friends. Joey and Tristan then collapse and beg for food. Tristan then remembers about snacks he packed for the trip, but then remembers everyone (except Solomon) left their packs back at the campsite. After Solomon tries to encourage them to go a few days without food, they take off to find some, but run into tree branches. Tea reveals Solomon had a bag of food and taunts them as she eats a chip. Solomon tells them all they had to do was ask nicely. While Joey and Tristan complain, Yugi notices that the mountains are moving and runs to the edge of the forest to see they're on an Island Turtle. Joey and Tristan try to be tough until Yugi tells them it won't attack them unless they keep it up. Joey and Tristan apologize but immediately do another victory dance. Téa complains about the lack of female friends she has, while the Turtle roars in annoyance to Joey and Tristan's song. It dives, forcing everyone to "abandon ship!" They then reach a temple in the middle of the lake and enter to have the doors shut behind them. Joey notices a "giant tea pot" in the middle of the room and (having switched with Yugi) the Pharaoh tells him it is not a tea pot. La Jinn the Mystical Genie of the Lamp emerges from the lamp. The Pharaoh summons Celtic Guardian and begins fighting the genie. Suddenly, the doors swing back open and a flood of water rushes in. It then freezes, trapping Téa and Solomon in ice. The perpetrator behind this is Neo Aqua Madoor, "Jack Frost's evil cousin". Tristan and Joey summon their monsters to help out the Pharaoh despite his constant protests, telling them to not interfere out of concern for their safety. Joey then tells him that they don't want to see him get hurt either as the Pharaoh realizes they can use the two enemies' attacks against each other. After faking head on attacks, Celtic Guardian and the others' capsule monsters back off as Neo Aqua Madoor and La Jinn the Mystical Genie of the Lamp's attacks collide into each other and destroy them. Téa and Solomon are released form the ice, and a tablet with Egyptian writing on it appears. Solomon translates it: " Before the shadows blanket the land, Go to the fortress of fear. Locate the place where the spirit sleeps, And the pathway you seek will appear." Joey takes out his map from earlier and realizes that it shows the exact space they're on right now and that the fortress is on the same square, but VERY far away. Everyone resolves to go there, hoping the pathway it mentioned means the way home. Tristan finds a secret passage under the main floor (as they did not want to take chances with swimming across) and they quickly run through it. Coming out above ground, they find themselves in an ancient graveyard that is soon flocked with Wood Remains and The Wandering Doomed. Yugi, Tea and Joey each release a new monster; Kuriboh, Dark Witch and the Flame Swordsman, respectively. With their new monsters, the Zombies are easily defeated. Racing to the top of the hill the fortress lays upon, Tristan jinxes their good luck as four walls rise up from the ground and surround the fortress with statues of the Aqua Spirit, Spirit of Flames, The Rock Spirit and Garuda the Wind Spirit at each corner. Joey unsuccessfully tries to fly over as he is repelled by a force field. Yugi figures out that if four people mimic the stances of the four statues, the door will open. They do so, forcing Yugi to enter the fortress himself. Yugi falls into a pit but is saved from a rough landing by the Pharaoh taking his place. The walls of the room they are trapped in begin to close in on them while outside, Joey breaks his pose and the statues come to life and begin attacking everyone. The Pharaoh finds a new capsule and releases the monster, which carries him up in a beam of light. Coming to his senses, the Pharaoh sees his new monster is Dark Magician and that his friends are in trouble. Using Dark Magician's "Magical Crossroads" the statues are destroyed at the cost of Solomon's Summoned Skull being taken down by the Rock Spirit. Inside the fortress, Yugi opens the coffin located in the fortress (the place where the spirit sleeps) just as the sun sets and everyone else comes in. The coffin turns into a doorway and a piece of golden armor hovers above it. Another riddle appears as the armor dons itself on Yugi. Solomon says it says five trials await them to test the strength of Yugi's heart. Despite some discussion about not going through with the trials, everyone decides to go along with it in hopes of it leading them home again. They arrive in a desert and find a village, where they are given a pendant and the instructions for the first trial: "Silence the whisper that rides the desert wind". While Solomon stays a safe distance from everyone else, they call forth their monsters and destroy a Medusa Worm, which they initially believed to be the enemy. However, it turns out to be one of many Medusa Worms under the voice's control. Everyone but the Pharaoh is spat on by a worm and is turning to stone. Dark Magician takes the Pharaoh above the storm and the voice sent to confuse them to show him a tornado causing it. The Pharaoh calls Dark Magician back to his capsule and proceeds on foot to reach the voice. However, he isn't strong enough to reach the tornado. He then sees a man wearing a cape and mask, telling him to merge with the Dark Magician to gain the strength needed to pass the trial. Doing so, the Pharaoh becomes the Dark Warrior and flies into the tornado to find the voice is Mystical Sand. Silencing her, the Pharaoh clears the trial and reverses the Medusa Worms' petrification on his friends. The armor takes a toll on the Pharaoh as he is not used to it yet. Yugi takes his place to relieve some of the pain and tells of the man he saw explaining how to use the armor. One of the five shapes on the pendant lights up to signify the victory over this trial, and a doorway comes out of the sand. Entering it, everyone finds themselves on a floating island above the clouds. Yugi collapses from the strain of the Duel Armor and is taken to a cave to rest. Another message arrives, and Solomon reveals that next is "The Trial of Light and Shadow". They are tasked with breaking an unbreakable stone in the "valley of light" as it appears only once a day. Deciding to take care of the trial in Yugi's place, Tristan, Joey, and Solomon head for the nearest valley as it becomes noon and the stone is revealed. However, a Prisman appears and begins to attack them. Tristan takes advantage of its short temper and uses it to blast the stone apart. In the meantime, Yugi has recovered, and Téa shows the Pharaoh the trial's instructions. Noticing they only know half of the trial, the Pharaoh realizes that by exposing the parchment to darkness, the second half is revealed. He realizes they are now in danger and takes off with Téa to find them. Elsewhere, everyone has picked up a large piece of the stone and smash Prisman to pieces. However, a Skull Guardian appears as a sign of the second phase of the trial beginning. Joey hoped he was there to congratulate them, but it began attacking instead. The Pharaoh once again merges with Dark Magician to become the Dark Warrior and easily defeats the monster. However, he spares it as a glow where the stone was appears. The Pharaoh then explains that the second part of the trial was to not only defeat the Skull Guardian, but to show mercy. This rewards them with the means to leave the island. At the same time the masked man from before appears to all of them and congratulates the Pharaoh on completed Level 2 of the trials. The Pharaoh wonders what will happen if he completes the trials, and the stranger explains that he will receive the power to rule the world as he will have proven himself a true king. However, even though the Pharaoh might not want it, there are others seeking it, and it must be claimed before someone evil does. Also, if they fail, they will be trapped here until the next challenger arrives. Using the wings found in the trial's reward chest, everyone flies off into another glowing doorway. Back outside the game, Dr. Brisbane is laughing evilly that soon the power to rule the world will belong to him. In the game, everyone has reached a volcanic area, where they must remove the Blade of Chaos before it's too late. Tristan gains a new monster, Thunder Dragon. Joey ends up separated from them, but returns, fused with Red-Eyes B. Dragon and full of evil. As Joey fights the Pharaoh in Dark Warrior mode, Joey begins to wonder why he is attacking his friend and realizes this happens because of his fusing with Red Eyes. Breaking free of the evil controlling him, Joey separates form Red Eyes, sees the Blade of Chaos is stuck in its thigh. Removing it, Joey clears the third trial and claims Red Eyes as his monster. Everyone leaves through another glowing doorway. They then end up in a jungle (where they learn that despite its apparent endless scenery, it is only as big as the game board itself). Their next test is to find a golden apple that "gives you a raise" and offer it up. Tristan finds a giant melon and draws a picture of himself on it. The fruit then falls down a hole, and everyone follows it to find themselves in a chamber with three long pedestals with an apple each on them. Tristan then notices his melon in the corner, which turns out to actually be a Petit Moth. Everyone attempts to leave, but are then caught in a labyrinth. Joey eats some of the fruit he took from the forest and instantly becomes a genius. Right as he is about to figure out how to get out of the labyrinth, a Battle Ox chases him away from his equations. At the same time, Téa gets a Seiyaryu after defeating a Jirai Gumo. Hopelessly lost in the meantime, Tristan releases a Shovel Crusher and it careens around the labyrinth like a lunatic, collecting his allies and depositing them back at the apple room. However, there is a slight difference. An apple is missing and a Cocoon of Evolution is where Petit Moth was. It hatches into Great Moth and Yugi becomes the Dark Warrior to fight it. However, a Dark Magic Attack simply further evolves it into Perfectly Ultimate Great Moth. The Pharaoh then realizes that he must eat one of the apples to evolve Dark Magician in order to stand a chance against the moth. Doing so evolves his magician into Magician of Black Chaos and earns them victory. He then takes the remaining apple to an altar, which opens a doorway. They then find themselves back at the camp where they were attacked by the Flower Wolves. The masked man appears and properly introduces himself as Alexander the Great. He then goes on to explain he once possessed the Millennium Ring, which he considered his lucky charm as it helped him conquer most of the world. However, prolonged possession of it caused a split personality to emerge (due to Zorc being sealed in the ring) and most of his retainers lost faith in him. He was then put to a test to see if he was still worthy to wear the ring by Shadi and was the first to participate in the Yu-Gi-Oh! Capsule Monsters Collectible Figure Game. However, though he was victorious in the trials, the door leading to the great power to rule the world did not open. This enraged his darker half into attacking his four vassals. It was then the pyramid punished him by splitting his soul in two. His darker half was sealed into the pyramid and he was sent to the game to act as a guide for future adventures. Alexander then gifts the monster-less Solomon with a new monster and tells him he will need it for the fifth trial. They head to a village, where Alexander explains that the fifth trial involves destroying five different elemental dragons known as the Fiendish Five that terrorize the village. They find a girl about to sacrifice herself to give their dragon god the strength to keep the five away. However, they intervene and promise to slay the dragons. Solomon, using his new Curse of Dragon against Aqua Dragon, the Pharaoh faces Tyrant Dragon, Téa versus Serpent Night Dragon, Tristan battles Luster Dragon #2 and Joey fights Meteor Dragon. However, despite the aid of Yugi's new Black Luster Soldier, everyone fails to defeat the dragons and are forced to return to the village. The Pharaoh then learns of a sword that can slay the five only if a large power descends upon the village. Tricking the five into coming towards the village, the Pharaoh frees the sword and slays them. However, the defeated dragons transform into the Five-Headed Dragon. The girl from earlier prays for her god's help and her tears free the Blue Eyes White Dragon from its picture, and it fuses with the Pharaoh and slays the Fiendish Five once and for all. With the trials now completed, everyone is about to be sent home, and Alexander is given permission to use Solomon's body as a means of taking himself out of the game. They arrive outside to find Dr. Brisbane acting normal and concerned for their safety. He then wonders if they found anything interesting in the game, and Solomon presents the trial pendant, now fully lit. Right as the evil side of Alexander tries to grab the pendant, the good side jumps into Dr. Brisbane and seemingly subdues his evil side. However, it's a trick as the evil side was stronger and fused together with his weaker good half. Evil Alexander takes the pendant and runs up to the doors and successfully opens them after waiting for thousands of years. Everyone chases him into the room and they find themselves in an alternate dimension. Shadi appears and wonders who should receive the power promised to the victor of his challenge. Though the Pharaoh protests that Evil Alexander cheated, Shadi points out that Alexander has a fair claim to the power as he tried himself and won thousands of years ago. To end the stalemate, Shadi announces one final Capsule Monsters battle. Evil Alexander summons the souls of his vassals to assist him and Good Alexander's Duel Armor. Evil Alexander fuses with Reshef the Dark Being and sacrifices his retainers' monsters to summon his Seven-Armed Fiend, the apparition from Yugi's dreams. Everyone but Yugi's monsters are destroyed except for their dragons and Seven-Armed Fiend is destroyed. However, Evil Alexander decides to use the remaining monsters he used for his sacrifice to power Reshef and use his pawns' pain connection to them as a shield. However, the Pharaoh, disgusted with Evil Alexander for how he treats his loyal subjects, fuses with his friends' dragons to form the Armor of Unity and destroys Reshef. The evil side of Alexander is purged and the good Alexander tells the Pharaoh that his reign over Egypt is what inspired him to be pharaoh himself. Alexander then passes on with his vassals. Shadi wishes to gift the Pharaoh with the power promised, but he instantly turns it down. Shadi then muses to him that the one who can rule the world need not possess the power. The pyramid then begins to collapse, and everyone manages to escape safely. They return to their pilots to discover the rescue plane has come. They talk the pilots into taking Solomon and Dr. Brisbane back to Domino City with them. Yami Yugi is also capable of activating the power of his Duel Armor and fusing with his monsters. As of episode 9, he has fused with Dark Magician, Magician of Black Chaos, and Black Luster Soldier. In episode 10, he also fused with Blue-Eyes White Dragon which the villagers know as the Divine White Dragon. Yugi has also fused with his friend's dragons to form the Armor Of Unity in episode 12. Joey was able to fuse together with Red Eyes Black Dragon when it was cursed with the Blade of Chaos in episode 7. He hasn't activated this ability again. Throughout Yu-Gi-Oh! Capsule Monsters, several Duel Monsters from the original Yu-Gi-Oh! are featured. 4Kids TV released a trailer for the Yu-Gi-Oh! Capsule Monsters series during the Teenage Mutant Turtles: Fast Forward premiere. A full length movie titled Yu-Gi-Oh! : Capsule Monsters was released on DVD in the United States on May 23, 2006. This movie is a compilation of the first six episodes of the series, edited together to form a more seamless storyline. A second disc with the remaining six episodes will be released later in the year. 4Kids had hosted a free "screening" of the first disc on May 22, 2006 on the yugioh.com website. During the preview the movie in its entirety was shown, when all 6 episodes were shown together, it lasted approx. 90 min. This movie has deleted scenes from the movie and extensions of some scenes during the movie. The second DVD, part 2, was released on DVD September 12, 2006. According to the most recent artwork, the full title is Yu-Gi-Oh Capsule Monsters 2: Trial Of The True King. According to the magazine Shonen Jump, there is a real life collectible game based off of the game seen at the beginning of the show. The Yu-Gi-Oh! Capsule Monsters Collectible Figure Game featured in the show is based on, but still different from, the Capsule Monster Chess game that featured in the Toei Yu-Gi-Oh! series and the first series of manga. Multiple cultural references were made throughout this series. For example, the group saw a temple resembling an Islamic mosque as well as a fortress that looked nearly identical to the Supreme Court building. Yu-Gi-Oh! Capsule Monsters, like all the other Yu-Gi-Oh series, is on Hulu. However, it is not treated as its own series, but as part of the second series anime's season 5, in between the Grand Championship and Dawn of the Duel. This page was last edited on 19 August 2018, at 10:04.